Learn about the performance tuning needs for SQL Server 2012 with this book and ebook. Each recipe given in this book is an individual task that will address different performance aspects to take your SQL Server's Performance to a higher level. The first part of this book covers Monitoring with SQL Server Profiler, DTA, System statistical function, SPs with DBCC commands, Resource Monitor & Reliability, and Performance Monitor and Execution Plan. The second part of the book offers Execution Plan, Dynamic Management Views, and Dynamic Management Functions, SQL Server Cache and Stored Procedure Recompilations, Indexes, Important ways to write effective TSQL, Statistics, Table and Index Partitioning, Advanced Query tuning with Query Hints and Plan Guide, Dealing with Locking, Blocking and Deadlocking and Configuring SQL Server for optimization to boost performance. The third and final part gives you knowledge of performance management with help of Policy Based Management and Management with Resource Governor. This book has individual recipes and you can read it from cover to cover or dip into any recipe and get solution to a specific issue. Every recipe is based on a script/procedure explained with step-by-step instructions and screenshots. Concepts are illustrated for better understanding of why one solution performs better than another. 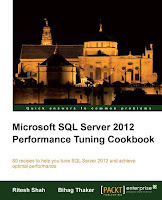 SQL Server 2012 Performance Tuning Cookbook is aimed at SQL Server Database Developers, DBAs, and Database Architects who are working in any capacity to achieve optimal performance. However, basic knowledge of SQL Server is expected, but professionals who want to get hands-on with performance tuning and have not worked on tuning the SQL Server for performance will find this book helpful.